Leonie has had a love of sewing for as long as she can remember. 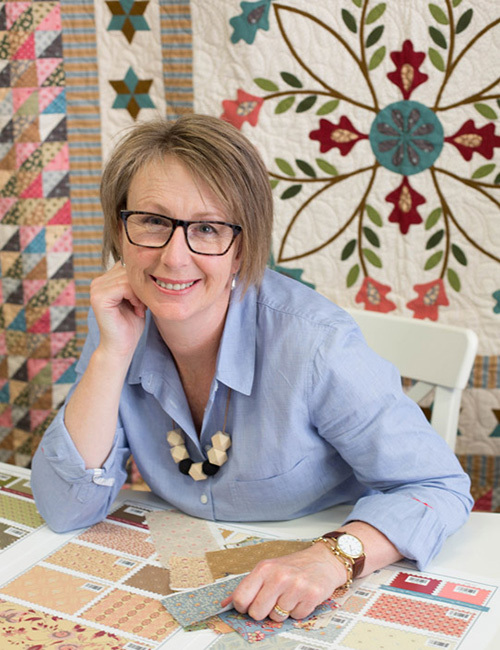 Patchwork entered her life back in the early 1990’s and she’s never looked back – she loves nothing more than to share her passion with others, and she does this by her many teaching engagements both in Australia and overseas. Many of Leonie’s designs feature woven wool applique. “Woven wool is a beautiful medium to work in – try it once and you’ll fall in love!” she says. She also has a love of needleturn applique. Leonie is a published author with Martingale, and her work has been featured in various magazines, both in Australia and overseas. She lives in New Town, just a few short minutes from the capital city of Hobart in the beautiful state of Tasmania, Australia. She is married to Dan and has two adult daughters, Ellen and Jess. Her online store, Essence of Cloth, in Australia, is where you’ll be able to view her complete range of designs. Stay connected with Leonie and follow her on Instagram @leoniebatemandesigns and Facebook: Leonie Bateman Designs. Click here for a video about Leonie.